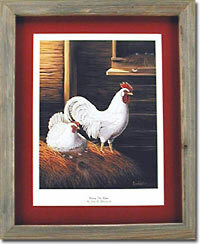 RULING THE ROOST: This is the second in a series of Limited Edition Prints by famed wild life artist, John Eberhardt. The artist has painted over 50 limited edition prints and been named artist of the year by various outdoor groups, such as Iowa Ducks Unlimited and Iowa Natural Heritage Foundation. The print has an image size of 11 inches X 14 inches and a print size of 16 X 20 inches. This will be a limited edition of 500 prints, with each print numbered and signed by the artist. They are unframed. These will make a beautiful addition to your den or a wonderful gift to a friend or relative. 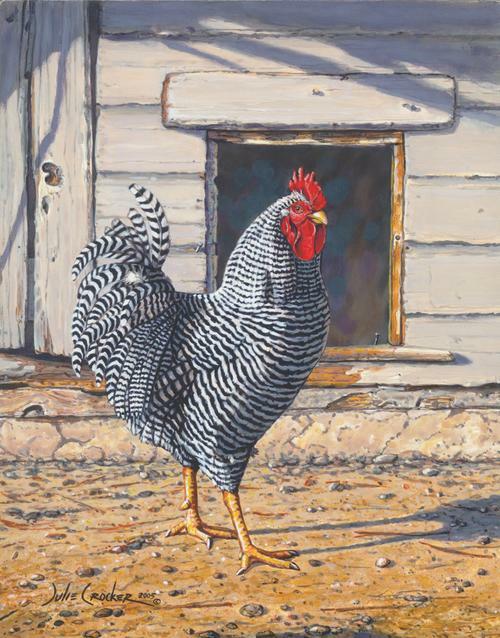 "MORNING STRUT" Limited Edition Print: The handsome Barred Rock Rooster, is the fifth print commissioned exclusively by Murray McMurray Hatchery. This painting was created by artist Julie Crocker. Julie is a rural Nebraska native. 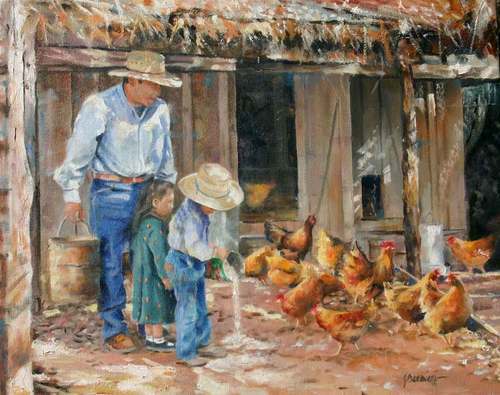 Her art is recognized nationwide and she has won numerous local and state awards. To her credit she has numerous Nebraska Habitat and Trout Stamps, Ducks Unlimited Prints, and won many awards at the "Wings Over the Platte Competition". Like the previous four prints in our Collector's Series, this wonderful print will be a limited edition of 500 prints which is bound to sell out early. The print has an image size of 12 x 15 inches and a print size of 16 x 20 inches. Each print is numbered and of course, signed by the artist. They are shipped unframed so you can match the framing with the environment you wish to display them in. 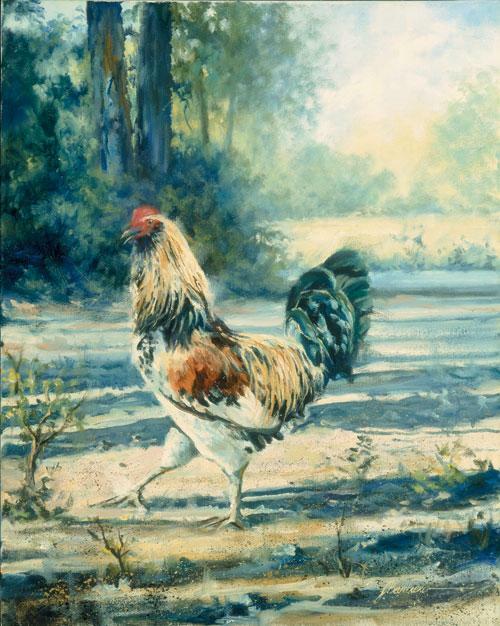 "MORNING STRUT" makes a beautiful addition to your home or a wonderful gift to a friend who enjoys the popularity of today's chicken decor. "The Apprentice" This is the sixth in a series of paintings commissioned exclusively by Murray McMurray Hatchery and third painting done by artist Joe Barbieri. His work has been shown at the Annual Mountain Oyster Club Show in Tucso, Az. The Print has an image size of 16x12 inches and a print size of 20x16 inches. This will be a limited edition of 500 prints, with each print numbered and signed by the artist. They are unframed. In conjuction with Murray McMurray Hatchery, John Churchman has released a special edition set of 12, two each picture, greeting cards. 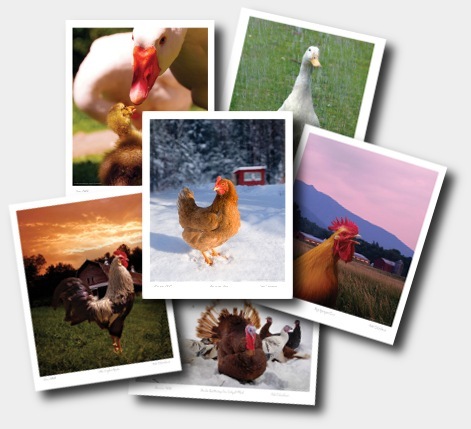 The 5" x 7" cards feature images of his poultry. The inside of each card is blank so that they can be used for all occasions. Envelopes included.